Find hotel near Cameron Highlands Butterf ..
A place which is rich in tropical flora and fauna is bound to have a butterfly garden. Established in year 1990, the butterfly garden in Cameron offers a colourful delight to the visitors owing to its various butterflies. They flutter and fly past you and thus offer you a lifetime experience. The park has been built to restore the biodiversity of flora in Malaysia in its own way. For children as well as schoolers, this is an ideal place to have fun as well as learn. How popular is Cameron Highlands Butterfly Garden? People normally club together Ee Feng Gu Bee Farm and Time Tunnel Museum while planning their visit to Cameron Highlands Butterfly Garden. Interactively fun. Bringing families and kids here. They are loving it. You will not disappointed to visit this farm. Easily noticed butterflies as they are everywhere inside the mini zoo. We have the chance to see few butterflies flying and perching from a flower onto another to stick it's "needle" sucking the honey. This farm also has beautiful landscape with flower plants grown and other insects and animals such as turkeys, rabbits, snakes, etc. The only recommendation I would like to share is regarding toilets cleanliness is fairly OK but the bad smells too strong. Please take initiative such as install automatic perfume dispenser. At least can keep toilets smell good. There's something to do for 2 kinds of people here: 1. The people who love beautiful colours, walking around in a idyllic place with butterflies flying all around them. They will also love all the flowers that are being grown in this place: they have a lot! In many, many colours! 2. The animal-loving people. Not only do they have tons of butterflies. There are also other kind of insects, arachnids and arthropods. Not only that, it's a small zoo: amphibians, mammals... You can check it out! Good to know: - There's a free toilet for both genders - There are shops close by if you're hungry or thirsty. If you like and respect animals, do not visit this place. It's a shame how small the cages of the animals are and how little effort was put into making them even close to an adequate animal housing. The only habitants who may enjoy their living here are actually the butterflies. But why a butterfly farm needs to keep cats, raccoons or turkeys is beyond my understanding. 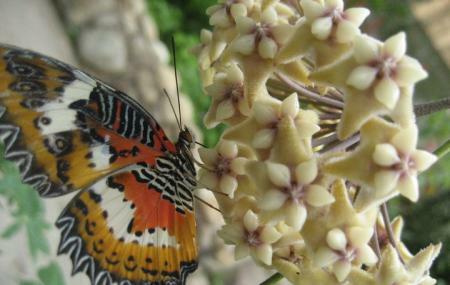 It can be classified as Mini Zoo because it is not only have butterfly, but it have several others animal exhibit there. The entrance fees for adult is RM 7. You can also seen the butterfly, racoon, snakes, lizards, squirrels, kangaroo, cat, duck, frog, turkey, scorpions, tarantula, Guinea Pig, etc.. But on the way to enter the place, it have restaurants but the restaurant is quite dirty because there is some spill on the staircase led to the butterfly farm. Anyway, it is good experience to go there. Recommended to all whom come with young children.